The British Ambassador to the Philippines and the British Embassy took a stand on the ongoing persecution of media organizations calling on local media people to support the British Embassy’s global campaign on press freedom. “In the coming months, you will see us in the Embassy very active on this issue. We will be working with the government, business and civil society. You will see us standing up for media freedom where we see it under threat. You will see us sharing our experience of how a free media is an essential element of any genuine democracy. 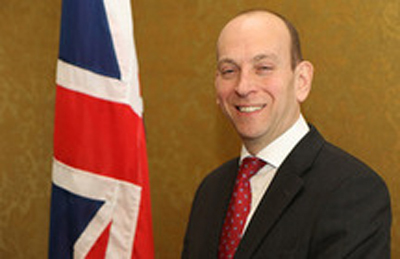 Because the freedom of the media is under threat,” said the new British Ambassador Daniel Pruce during the Embassy’s annual media reception, Thursday night at the Ambassador’s residence. The Embassy will be launching activities to foster improved media literacy, support professional journalism and ecourage the exchange of views on media regulation. This year, 80 media people were killed worldwide, six were Filipino journalists, and about 348 were injured. He said his country was cognizant of the fact that many media people were often harassed and persecuted through a lopsided due process. He and the Embassy noticed that the media are prevented from going about their legitimate work as legislative and practical barriers increased due to the influence of wealthy political people. “Media institutions are increasingly vulnerable to political and economic influences that limit their capacity to work independently and in the public interest,” he said. “A free media is an essential ingredient to a well-functioning democracy and the rules-based international system. Without it there’s no accountability. A free press is bound up with good governance, democracy, equality and poverty reduction,” Pruce added. He admitted that supporting the media from fake news and propaganda means countering the incoming tides of disinformation. “While it has never been easier to publish and receive information, it has also never been easy to spread lies and conspiracy theories. The UK is committed to media freedom and the protection of journalists across the world. Throughout the year, the UK government will shine a spotlight on media freedom issues and increase the costs on governments that impinge on those freedoms,” Pruce said. In July, the British government will host a conference in London yo bring together countries and individuals to mobilize a consensus behind the protection of journalists. “This is just the beginning. In the longer term, we want to see a reduction in state barriers to a free media, countries living up to their commitments and the taboo on attacks against journalists regaining widespread acceptance,” Pruce said.